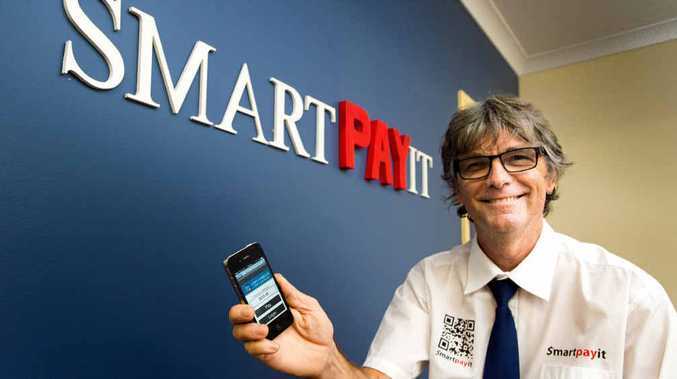 WAY TO PAY: Smartpayit CEO Keith Anderson at the launch of Coffs Harbour’s newest technology this week. A COFFS Harbour technology company believes it has revolutionised the way people will pay bills and accounts instantaneously with their smartphone. Developed around smartphone compatible QR codes the service sees customers download the company's phone app and establish an account with a link to their credit card. Customers then scan the Smartpayit codes on their bills and settle the account with immediate payment. After two years of research and development, Smartpayit went live this week. Coffs Harbour mayor Denise Knight attended the company's launch as Coffs Harbour earned the tag of being a 'smart city'. The council has introduced Smartpayit as a new mobile option for ratepayers to pay their accounts and store their receipts. "There's nothing like it in the world, the speed of transaction is our point of difference," Smartpayit CEO Keith Anderson said. "We are a merchant banker partner with the NAB so safe and secure payments are made and received instantaneously - there is no next day clearance or delay. "There are indications that other companies are working to develop these types of payment methods for point of sale transactions by 2015, but we focus on paper bill payments and already we are speaking with five other councils. Coffs Harbour ratepayers will notice the Smartpayit QR Codes on their next statements.